A weekly newspaper beat a tight deadline to run a front page wraparound marking the “shocking” death of a well-known sportsman from its patch. The Coleraine Chronicle paid tribute to motorcycle racer William Dunlop, who died aged 32 after crashing during practice at a race meeting in the Republic of Ireland on Saturday. Mr Dunlop, from Ballymoney, County Antrim, was the son of Robert Dunlop and nephew of Joey Dunlop, also both well-known bike racers who died in crashes. The Chronicle ran its wrap on Monday and is planning further coverage following Mr Dunlop’s funeral, which was held yesterday. 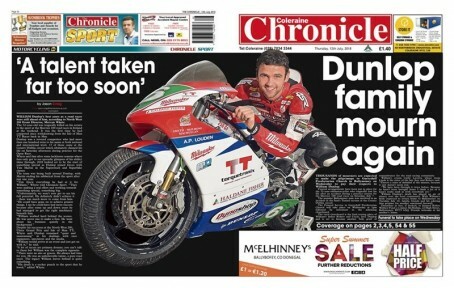 Editor John Fillis told HTFP: “We decided that the wraparound would be the perfect tribute to the shocking and untimely death of William Dunlop as it crossed both the news and sport agenda. “Obviously a massive local story as William was from Ballymoney, it also had worldwide ramifications as the Dunlop family name is so well-known throughout the motorcycling fraternity right across the globe. “The story also had a certain poignancy as it was another Dunlop taken far too soon – following the untimely and tragic deaths of his father Robert and uncle Joey. “We hope that the wraparound and coverage inside has gone down well with all our readers, motorcycling fans or not and we have heard that the family have appreciated our efforts to give William a proper tribute edition. “We were up against it in terms of deadline as the crash happened on late on Saturday and we publish on a Monday but we feel that a hard working staff team effort paid off, including the contributions of key contributors such as photojournalist Stephen Davison and Armoy Road Races Clerk of the Course Bill Kennedy who both know the family well. Really nice to see this. It’s a pity the Coleraine chronicle has ‘died’ over the recent years and they have to use multiplication figures to cover their readership within a family. I recently just moved from Coleraine to Glasgow and stopped buying the chronicle a few months ago due to their news being weeks out of date. Well done to the Coleraine Times who led with an emotional cover. Well done to all involved in treating local news how it should be treated, with importance given to the key matters or stories from the patch,not always the case in an industry driven by getting the paper filled cheap as chips and where UGC is king. Great tribute by the Coleraine Chronicle. Just a pity this weeks edition had multiple spelling mistakes throughout and pictures from 2 – 3 weeks ago.